As an advocate, litigator and mediator in both government and private practice, Carolyn G. Labin, Esq., has a decade of experience practicing law in both New Jersey and Pennsylvania. Carolyn started her legal career as a clerk in the Appellate Division of the New Jersey Superior Court for the Honorable Michael Winkelstein, J.A.D. After clerking in the Appellate Division, she joined the Division of Law at the New Jersey Attorney General’s Office, where she worked in the Education and Higher Education Section. As a Deputy Attorney General, she excelled in her section representing the Department of Education in administrative, civil and appellate matters and in both Federal and State court. She also counseled two boards during her time at the Division of Law: the Professional Teaching Standards Board and the Board of Examiners, the Board that issues, suspends, and revokes teachers’ licenses. Because of Ms. Labin’s interest and performance in her appellate work, she also served on the Sexually Violent Predator Task Force at the Division of Law where she wrote briefs and argued cases for the State involving the civil commitment of sexually violent predators. As a Deputy Attorney General, she received two consecutive New Jersey Public Service Awards for her outstanding performance. She was awarded an Exceptional Service Award in 2005 for her handling of a teacher’s license revocation case and was awarded a Teamwork/Partnership Achievement Award in 2006 for her work on federal litigation, which resulted in the dismissal of a number of cases against the Department of Education. Finally, while at the Division of Law, she co-wrote a brief to the Third Circuit Court of Appeals, which resulted in the Third Circuit convening en banc and overruling prior precedent in favor of her client. After Carolyn left the Division of Law, she was then offered a job at the Department of Education as a mediator in the Office of Special Education. As a mediator for the Department of Education, she was involved in approximately 100 special education disputes between parents and school districts. In 2011, Carolyn joined the law firm of Klineburger and Nussey where her focus is centered upon appellate cases and civil litigation. 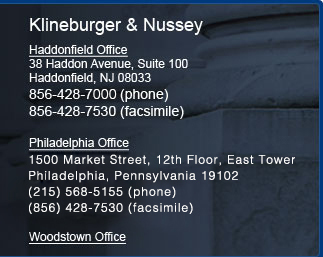 Carolyn’s experience and drive and have assisted in many, many successful appeals both prior to and during her time with Klineburger & Nussey. 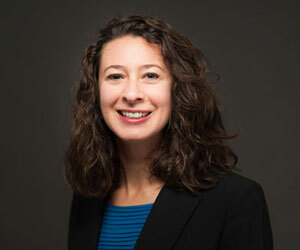 Carolyn graduated from the University of Scranton in 1998 with a Bachelor of Arts in History and Philosophy. In 2002, she graduated from the Beasley School of Law at Temple University.